One of the many missions of the Archives & Special Collection Department at the Tarlton Law Library is to document the history of the University of Texas School of Law. As part of this mission, the library collects artifacts from Texas Law's student organizations and events. Among these artifacts is a collection of over 150 t-shirts representing nearly 40 different organizations and events. The collection includes shirts ranging from the early 1980s up to today. The variety of shirt designs is a testament to the creativity of Texas Law students and details changing trends in popular culture as well as the culture of the law school itself. The complete Texas Law T-Shirt Collection is now available to view online. Many shirts in the collection use traditional legal imagery and symbolism. Gavels and scales are featured prominently on a number of shirt designs while the Lady Justice, the blindfolded personification of fairness in the judicial system, can be seen reimagined as a Texas longhorn, an armadillo, and a cowgirl, among others. Shirt designs often parodied films, television, books, and popular advertising campaigns of the time. Various shirts feature Disney characters, Dorothy and Toto, Ninja Turtles, and Maurice Sendak's Wild Things to name a few. One shirt references the "Little. Yellow. Different." campaign launched in the late 1980s by Nuprin, a short-lived ibuprofen brand. Parodies of automakers' branding have remained popular over the decades, with shirt designs inspired by Porsche and Volkswagen. 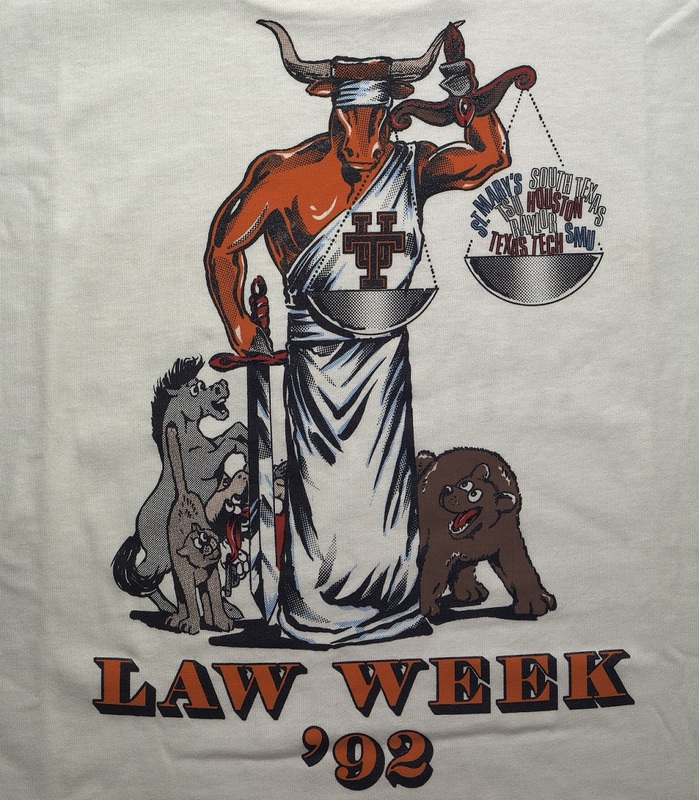 Still more shirts use images typical of the law school and the University at large such as the Longhorn, sunflower, or Peregrinus. 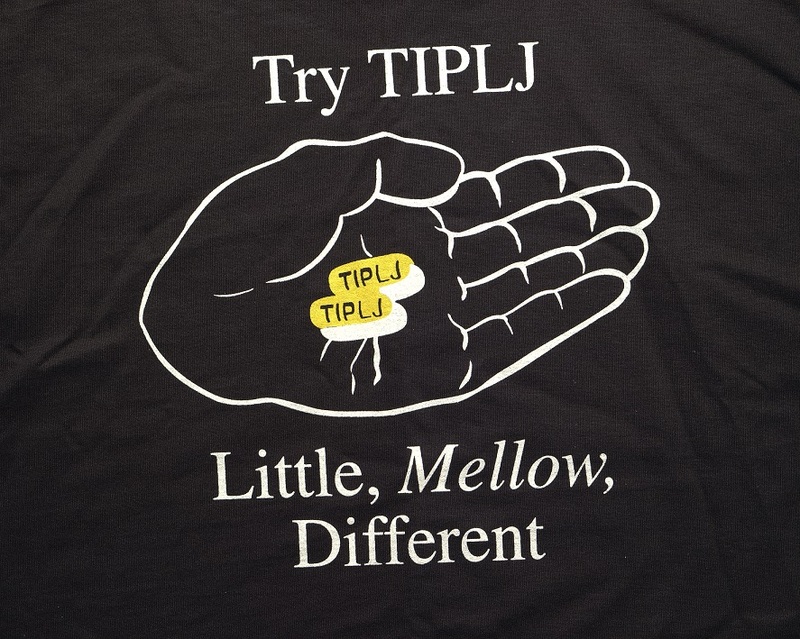 Faculty members and law school specific inside jokes are also popular subject matter for shirt designs. 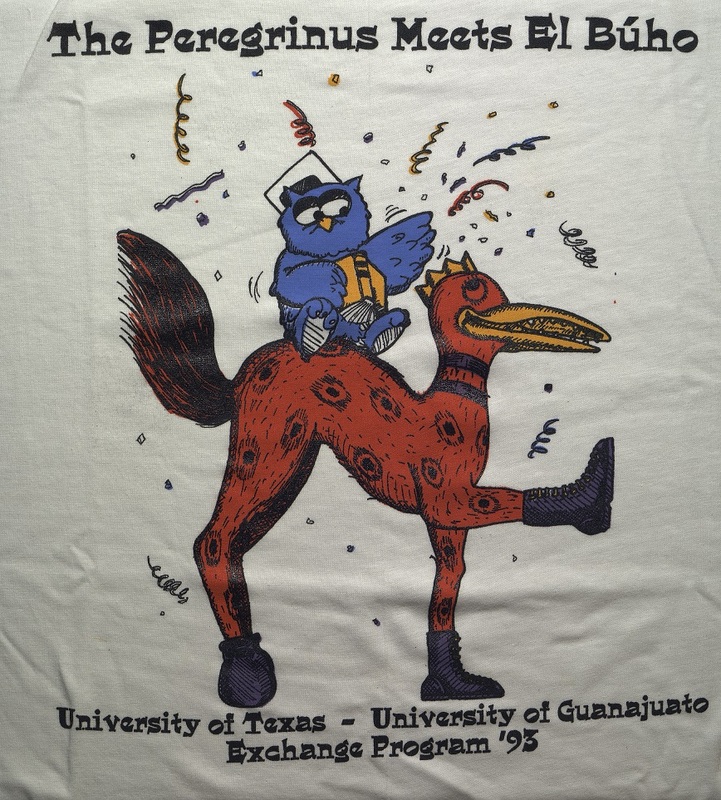 The Texas Law T-Shirt Collection is a large and growing collection that documents a number of important facets of student life at the School of Law, including social, academic, and charitable activities and events.